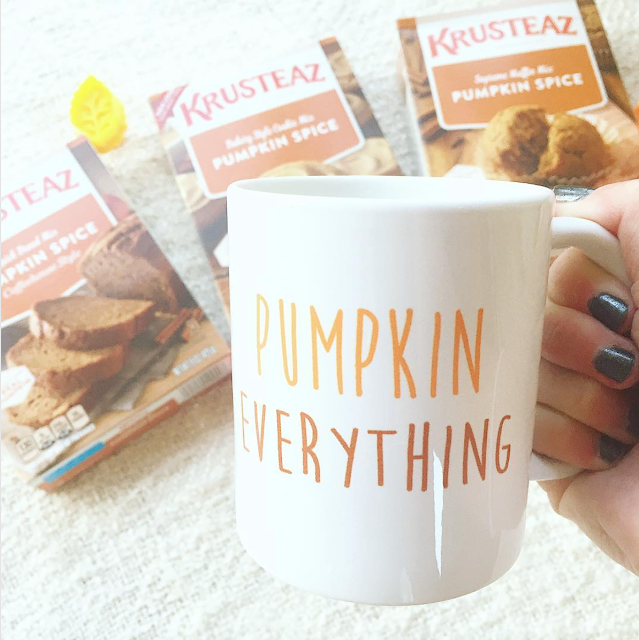 We are most definitely all about the pumpkin everything. Pumpkin is one of our favorite flavors, and not just in the Fall. We love pumpkin year round, but it's so nice that this time of year pumpkins are in season and we can enjoy it even more. The moment it turned Fall-ish (and because it is the South I'm totally going off the calendar and not the weather because today it's 90 degrees! ), we dusted off our cookbooks and bookmarked some of our favorite pumpkin recipes to put on our menu. From appetizers to delicious desserts the pumpkin options are endless! I love love love the yummy pumpkin bread recipe Carrie Beth shared last year. I've been majorly craving it for months, but haven't had the time to make it. Sometimes I just need something quick and easy to satisfy pumpkin craving. 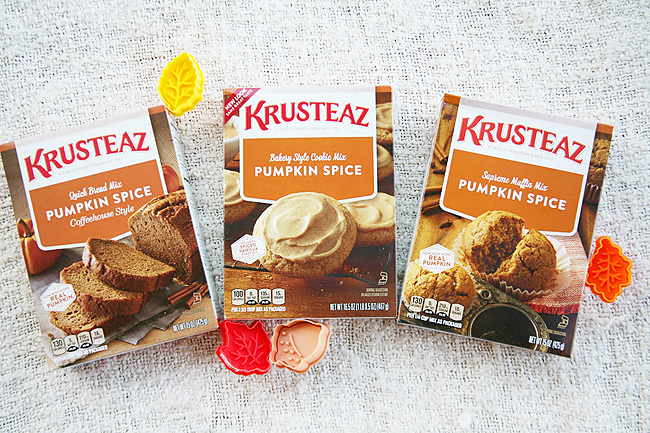 I stumbled upon these Krusteaz baking mixes and let's just say we are slightly addicted. They are so yummy! I love that they only require a few ingredients, and they are usually things I already have on hand. I can make a quick and yummy dessert that everyone loves with very little effort. Now that's my kind of pumpkin everything! Over the weekend I needed a dessert for a dinner, but with sports and other activities didn't have a lot of time to make something extravagant. 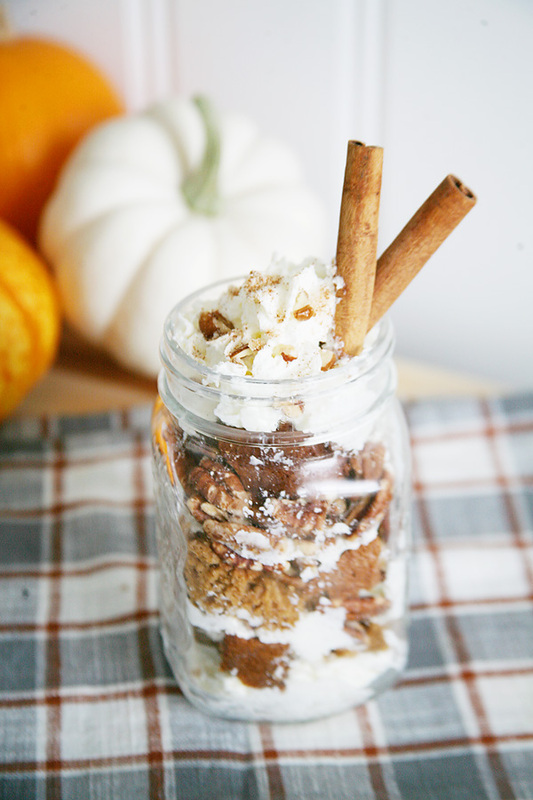 After doing a little brainstorming I came up with these easy Pumpkin Spice Parfaits. 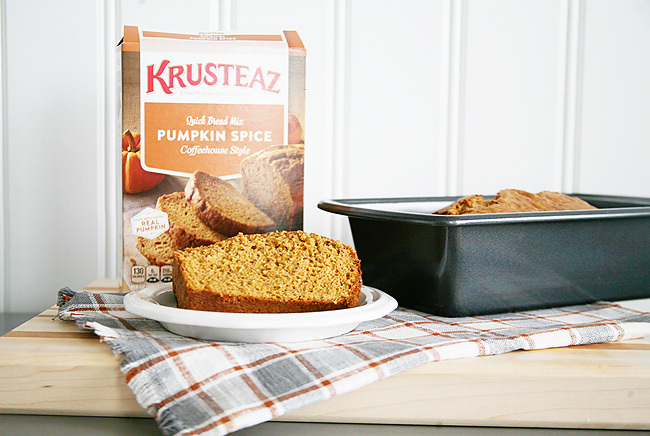 Because I already had some Krusteaz Pumpkin Spice Quick Bread on hand it cut my prep time down to nothing. Not to mention so. much. YUM!! 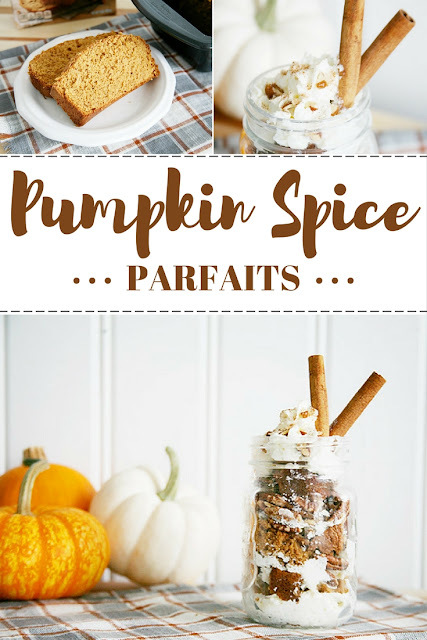 If you want a little pumpkin spice fix, or need a quick dessert option for the upcoming holidays this is definitely a recipe to put on your radar. Bake Kruzteaz Quick Bread according to instructions. Let bread cool then slice and set aside. 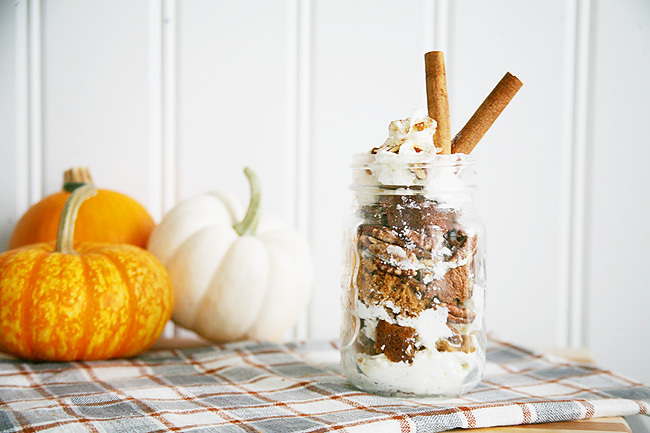 In a trifle dish or individual serving pieces (we love to use mason jars!) spread the bottom with a small amount of heavy whipping cream as your base layer. Break slices of the bread into large pieces and layer over the whipping cream. Then layer with whipping cream, pecans, and bread. Repeat until filled to the top. Top off with whipped cream. Sprinkle lightly with the cinnamon/sugar mixture and a few pecan crumbles. Garnish with cinnamon stick. Serve and enjoy! Note: Might also taste yummy garnished with drizzled caramel or butterscotch chips! 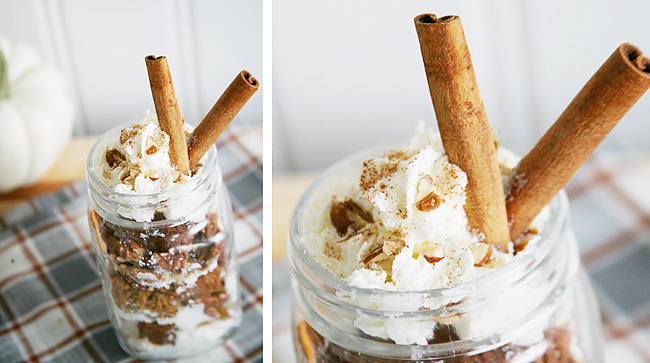 Such an easy - yet yummy - dessert! I love that the quick bread mix was able to help me in a pinch, and I know it will be a favorite of ours all season. We want it to be a favorite of yours too! 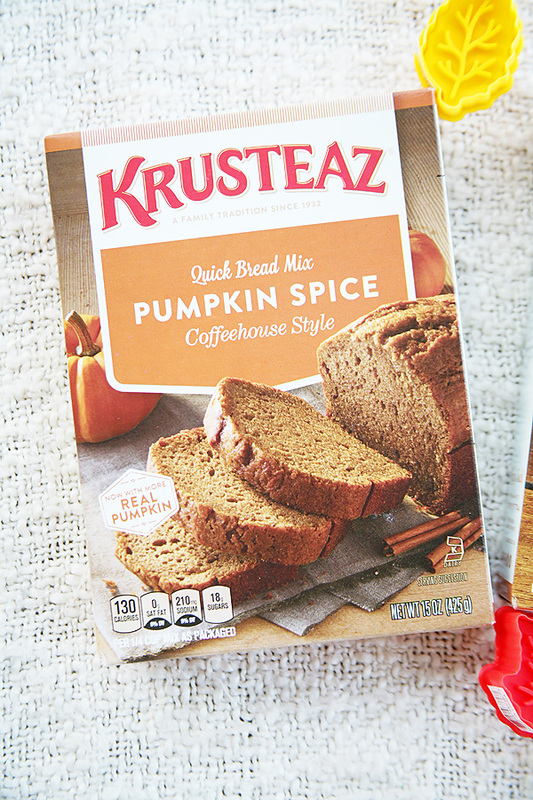 We are partnering with Krusteaz and giving one lucky reader the chance to win a fun Pumpkin Spice kit of their own. Enter below and the winner will be announced on Friday, October 20th. What is your favorite pumpkin recipe to make during the Fall? *Winner will be chosen randomly. Winner must be 18 and up, and a resident of the United States. Winner must respond with in 48 hours or a new winner will be chosen. All prizes will be sent to the winner directly from the brand. ** We received this product from Krusteaz for review, but all thoughts and life changing opinions are our own. Yummy these look so good.